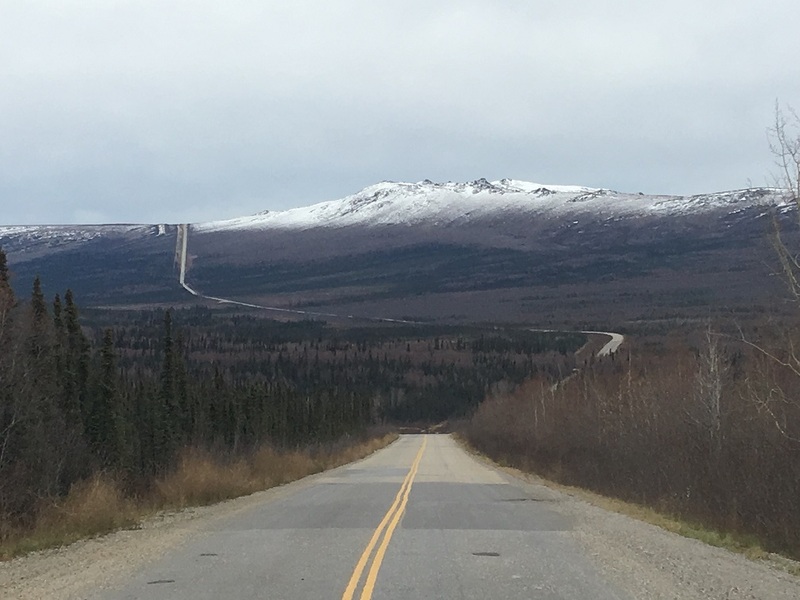 Beaver Slide is near mile 110.5 on the Dalton Highway and it is downhill when heading north. The road gradient is approximately 11% and the road prism is on a side hill. The embankment is about 3 feet on the high (west) side and 7 feet on the low (east) side. Each year, there are frost boils and soft spots that usually appear in late April and remain all summer. The soft areas will heal up if there are periods with no rain, but as soon as there is a significant amount of rain they will reappear. The soft areas go away after freeze up. The frost boils have resulted in extremely unsafe driving conditions and frequent accident occurrences. Past repair efforts indicate conventional road construction methods do not work. There are three necessary elements in the formation of frost heave: (1) frost susceptible soil, (2) subfreezing temperature, and (3) water. 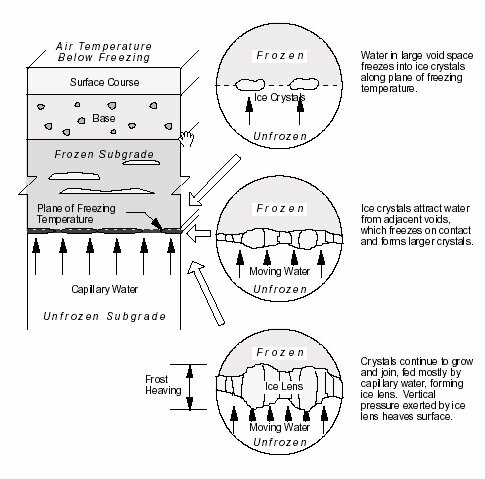 For frost heave, during periods of freezing, water in large void space freezes into ice crystals as the freezing front is moving downward into the road. As water is drawn to the freezing front by capillary movement through the frost susceptible soils, the ice crystals continue to grow, causing the road surface to heave. During the spring, the ice lenses start to melt and the fine soil particles are separated from the matrix, which causes depressions and soft areas at the road surface. Engineers from the Alaska Department of Transportation & Public Facilities (AKDOT&PF) tried several conventional methods to mitigate the frost boil issue but none have eliminated the issue. Therefore, removal or minimizing of the three conditions will mitigate the frost heave and thaw weakening potential. One potential method to solve this issue is to rehabilitate the section and substitute with better materials (for example, with non-frost susceptible soils). However, this method is not feasible due to the extremely high cost and long transportation distance to the remote site. It is also not feasible to artificially alter the environmental condition, which is the source of water. The most practicable way is to reduce the water content in the pavement structure. AKDOT&PF has tried to install French drains to reduce the water content in this road section. This conventional repair method does not work well because the French can only drain free water or runoff water from the road surface and drainage ditch. The capillary water in the pavement structure cannot be drained by conventional drainage methods. The H2Ri Wicking Fabric has been recently developed by TENCATE GEOSYNTHETICS (North America). The fabric has a high specific surface area (consequently high wettability and high capillary action) and high permeability. Preliminary laboratory tests indicate it has great promise as a cost-effective means to solve the frost boil problems on northern road systems. The purpose of the proposed project is to verify the effectiveness of the H2Ri to mitigate frost boils in Alaskan pavements. 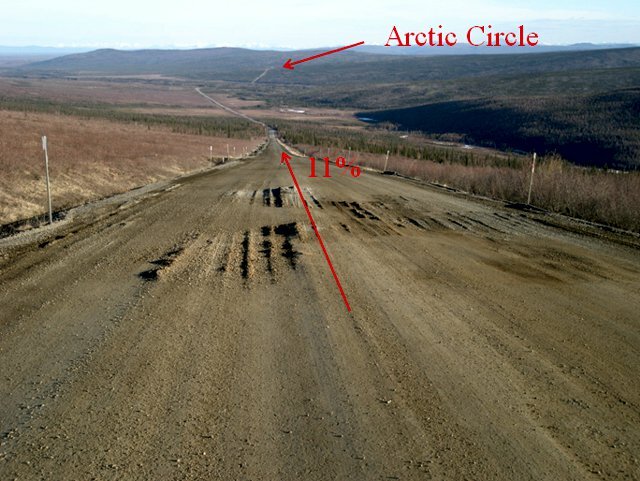 A test section was built at the Beaver Slide area of the Dalton Highway with installation of two layers of H2Ri. The test section was instrumented with moisture and temperature sensors to measure the temperature and moisture changes for two years. Results were analyzed to evaluate the effectiveness of the H2Ri to mitigate the frost boils in Alaskan pavements. © 2019 Beaver Slide Project. All rights reserved.